12 o’clock at 12 o’clock? Boring! Let’s try something else. There are several watches in which the dial is twisted with respect to the usual arrangement. Here is a selection in ascending price order. Let me know if I’ve missed some! The Avigation Watch Type A-7 1935 is a chronograph powered by a column-wheel movement developed exclusively for Longines by ETA, the movement-constructing company that, like Longines, is now part of Swatch Group. The Avigation Type A-7 has a classic military appearance, and its dial is characteristic of the early pilot’s watches style. The dial and crown are rotated by 40° right, reflecting 1935 U.S. military specifications. The position of the crown is convenient for operating the chronograph using the pusher. The watch has a 41mm steel case, solid caseback, water resistance 3 bar/30 metres, with a brown alligator strap with pin buckle. Case thickness is not specified, but it looks like around 14 mm, so fairly thick on the wrist. The watch is powered by the self-winding L788.2 movement, made by ETA as the A08.L11, a variant of the ETA 7753 that was introduced in 2012. It has a column wheel and a horizontal clutch. Price €2,960. Read more here. The spectacular Model 222-RR by RGM is a classic American railroad watch with the twisted dial arrangement, powered by an authentic vintage Hamilton pocket watch movement. 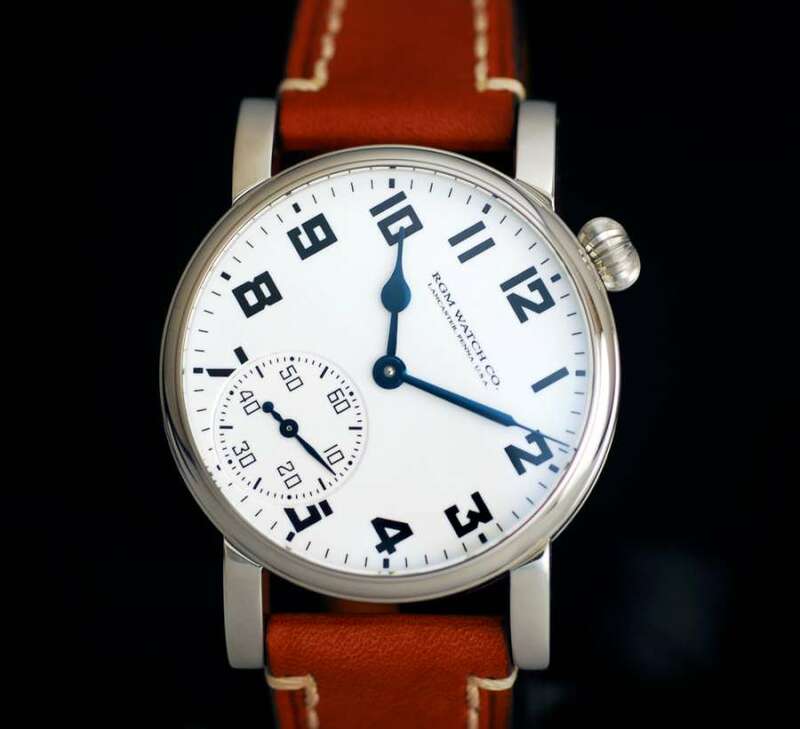 The case is in steel, 41 mm in diameter, 12 mm thick, with grand feu enamel dial and chunky numerals in a style introduced by Ball in 1925 and known as the box car dial. The 60° rotation of the case is a clever way of using the pocket watch movement in a wristwatch, making the crown accessible on the side of the watch. The Model 222-RR is available with two vintage Hamilton movements, calibre 921 or calibre 923. 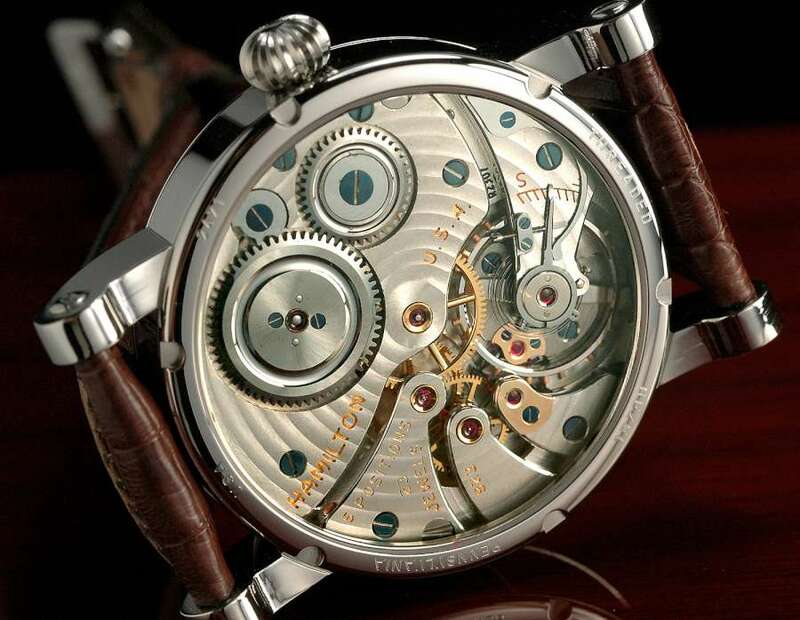 In both cases the movement is restored by RGM with a new mainspring, and hand-polished steel components. Both run at 18,000 vibrations per hour, 2.5 Hertz. Price from about €4,900. Read more here. 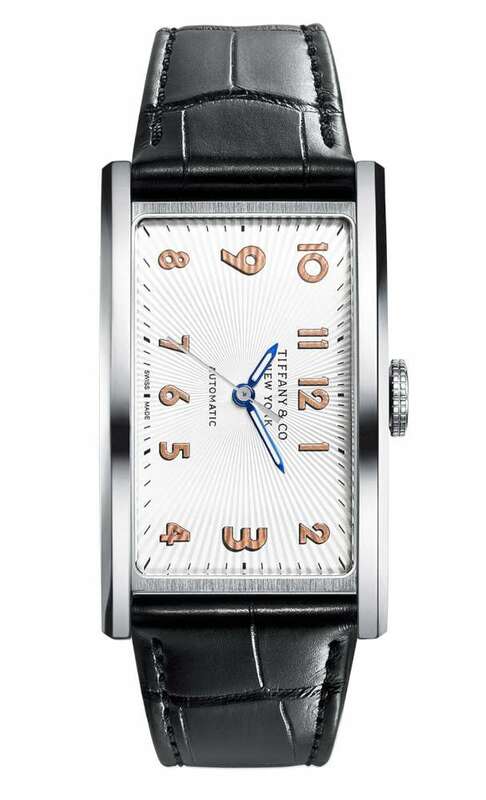 The Tiffany East West is a rectangular watch with a case at 90° with respect to the usual orientation. The case is 46.5 mm tall and 27.5 mm wide, with an attractive curving profile and watchglass. The radial guilloché dial and gold poudre numerals add a vintage look. It is powered by the Sellita SW1000, a self-winding movement made in Switzerland, with a 40-hour power reserve. This movement is a small circular calibre, just 20 mm in diameter, visible through the caseback. 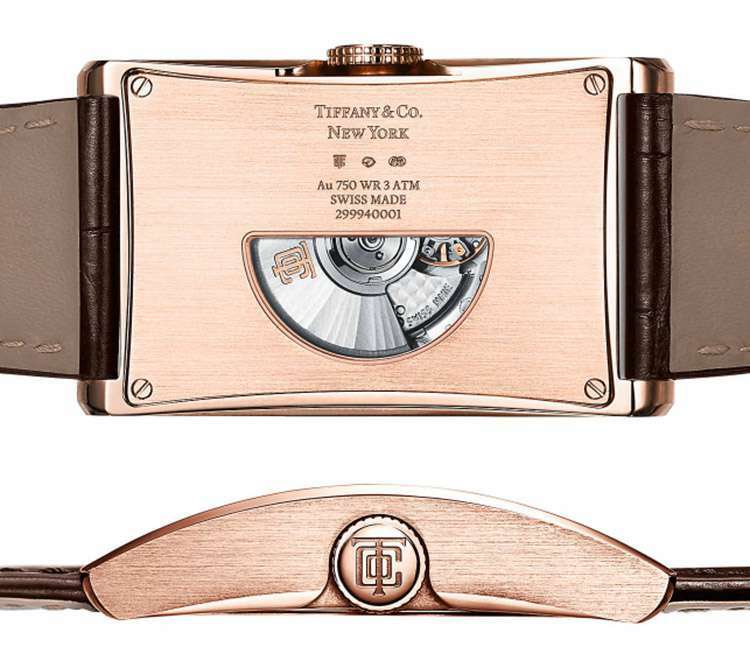 The version in steel costs €5,400, a version in rose gold costs €13,400. Read more here. 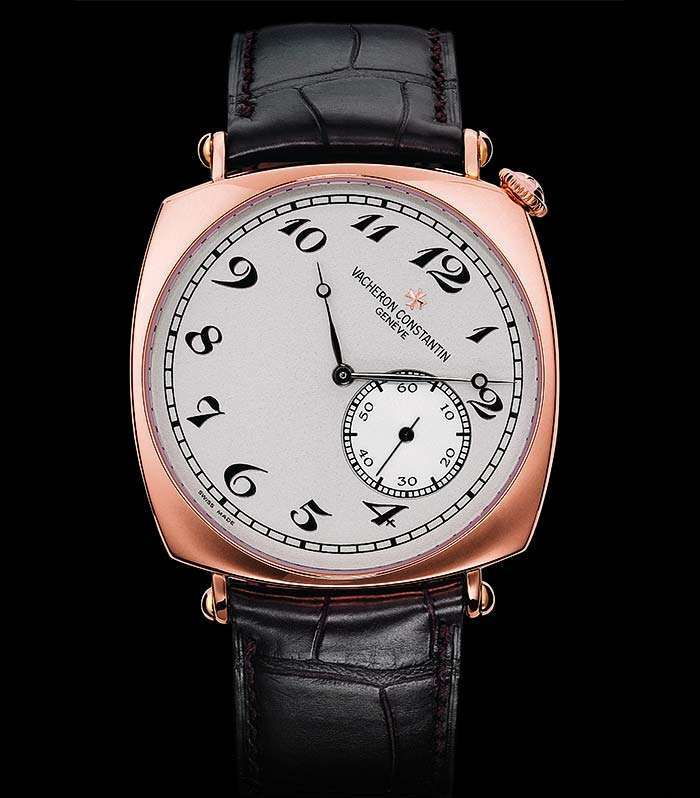 The Historiques American by Vacheron Constantin, launched in 2008, is a beautiful watch with a 40-millimetre cushion-shaped case, super-slim at just 8 mm. It is powered by the Calibre VC 4400 hand-wound movement, visible through the sapphire caseback. It is a quirky combination of an Art Deco-style dial, a case with the crown nicely positioned at the top right-hand corner, and a small seconds dial which is conventionally vertical. 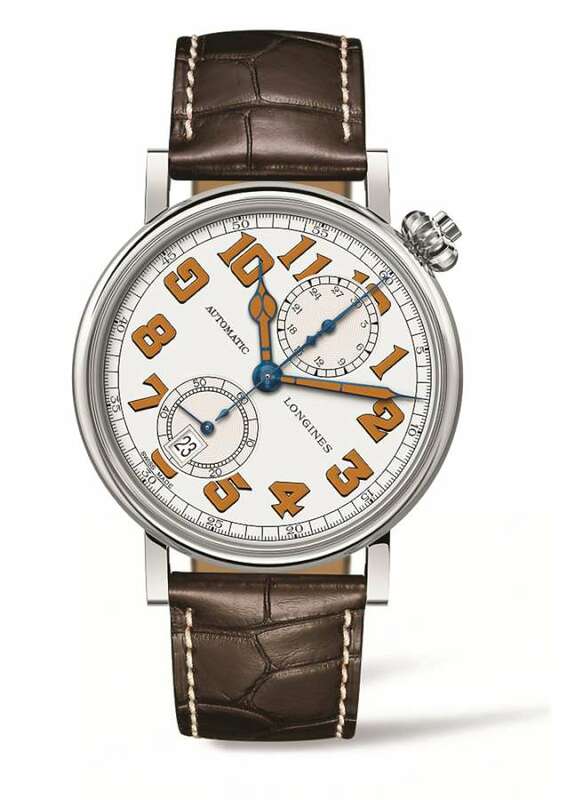 This version of the Historiques American is based on watches that Vacheron Constantin made exclusively for the North American market, with the same sort of rotation. 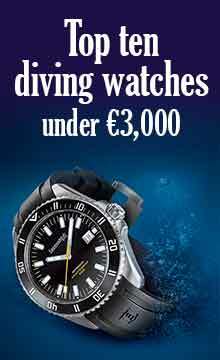 Like most watches in this arrangement, the display is approximately vertical when you are working at a computer. Price of this model is €35,900. 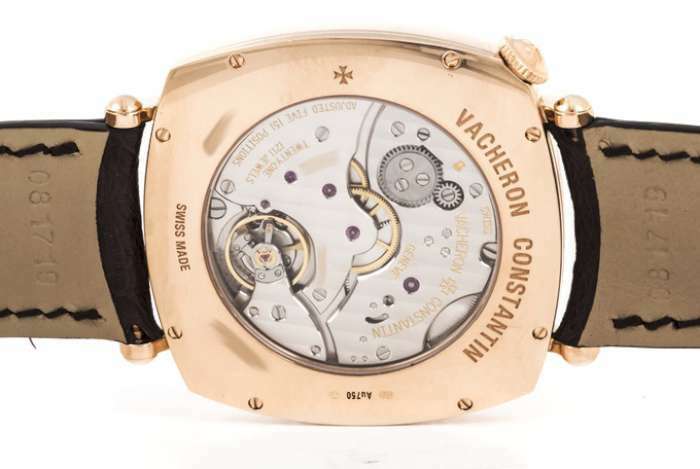 Read more on the Vacheron Constantin website.